In the years since the death of Kim Jong-il and the formal acknowledgement of Kim Jong-un as head of state, the North Korean regime has made a series of moves to further augment and consolidate the ideological foundations of Kimism and cement the young leader’s legitimacy. Historical narratives have played a critical, if often unnoticed, role in this process. This book seeks to chronicle these historical changes and continuities. 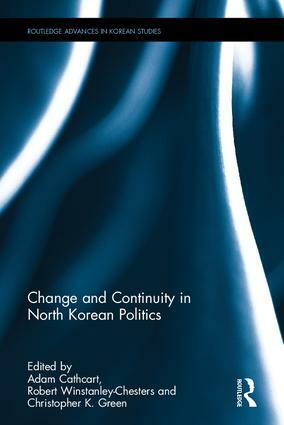 Continuity and Change in North Korean Politics explores the stable and shifting political, cultural and economic landscapes of North Korea in the era of Kim Jong-un. The contributors deploy a variety of methodologies of analysis focused on the content, narratives and discourses of politics under Kim Jong-un, tracing its historical roots and contemporary practical and conceptual manifestations. Moving beyond most analyses of North Korea’s political and institutional ideologies, the book explores uncharted spaces of social and cultural relations, including children’s literature, fisheries, grassland reclamation, commemorative culture, and gender. By examining critical moments of change and continuity in the country’s past, it builds a holistic analysis of national politics as it is currently deployed and experienced. Demonstrating how historical, political and cultural narratives continue to be adapted to suit new and challenging circumstances, this book will be of interest to students and scholars of Korean Studies, Korean Politics and Asian Studies. Adam Cathcart is lecturer in Chinese history at the University of Leeds, UK. He is the editor of the Sino-NK research website, and of the Papers of the British Association of Korean Studies. Robert Winstanley-Chesters is a Research Fellow of Australian National University. He is the author of Environment, Politics and Ideology in North Korea: Landscape as Political Project (2014). Christopher Green is a researcher in Korean Studies at Leiden University, Netherlands. He is the former international affairs manager of Daily NK in Seoul and translator of the memoir of senior North Korean defector Hwang Jang-yop.